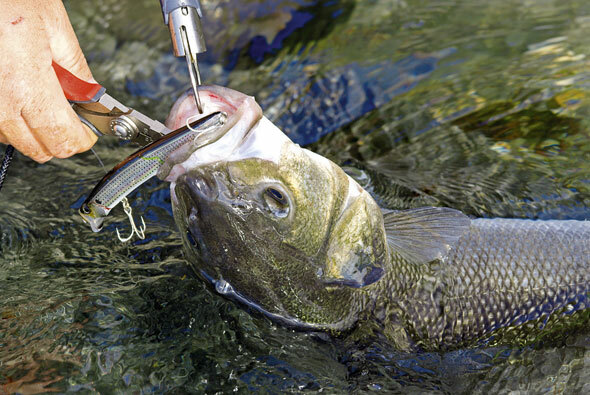 Henry Gilbey explains how to handle and release bass without getting hurt. Bass don’t bite humans – they try to spike and cut them instead! You know what’s going to happen – the angler grabs the shiny looking fish and reels back in pain. We can’t repeat exactly what the shocked angler says as he mops the blood seeping from his hand. Like a lot of anglers new to bass fishing he didn’t realise the fish was armoured like a Roman legionary! Every bass angler has done the same thing, and probably bears the scars, or at least the painful memories of his first encounter with an ‘ironclad’. The bass should actually be renamed the Wilkinson fish because its gill plate is razor-sharp, so sharp in fact that even seasoned bass anglers take great care when grabbing a hooked fish. The other danger area is the fan-like dorsal fin, which the fish raises in anger or when under threat. Armed with a row of spines like sail-makers’ needles, the unwary hand can easily be punctured. No wonder it’s called a ‘spiky’ by some anglers. All joking aside, you do need to know how to land and handle a gutsy bass so that you don’t keep spiking yourself – it could put you off bass fishing for life. So here we are going to talk about three important areas of bass care: how to unhook them, how to handle them and, and just as importantly, how to return a fish unharmed to the sea. There is nothing wrong with taking the odd bass to eat, but I am guessing that most of you want to return the majority of the fish you catch. 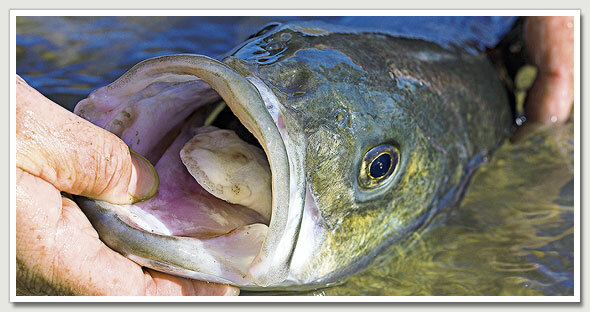 Here’s something you ought to know – the 4-5lb fish taste the best: the bigger brutes should be left to breed. The easiest way to land a bass when you are fishing off the beach or in an estuary is to literally let the sea do it for you. Time it so that you can ease your fish on to dry land as a wave recedes, or simply wade into the shallows and pick up the fish either by the bottom lip or with a specialist fish-grab tool. The problem is, bass have an escape routine. They can spin, buck, twist and kick when you are least expecting it, resulting in the fish scarpering in front of your eyes. This is where fish-grab tools like the Berkley Tec Trigger Grip are so handy. I wouldn’t go bass fishing without one now. A fish-grip is essentially another pair of hands that securely locks on to the fish’s bottom jaw, without harming it in any way, and without any chance of it twisting free and falling off. Most fish-grips have some kind of trigger system that you need to press or pull back to open the jaws of the tool and then clamp on. The jaw will not then open until you press or pull the trigger again. They are designed to cause no harm to the fish’s jaw, so while it might sound like a pretty brutal way to deal with a fish, in fact it is very humane. Anything is better than dropping a fish because it has twisted out of your grip and spiked you. There are a lot of different fish-grips that don’t cost very much and do an excellent job. Most are fairly small and highly portable. When you see one for the first time I would guess you might recoil at the robot-like stainless steel jaw, but once you start using one you will wonder how on earth you ever managed without it. The original and still one of the best fish-grab tools has to be the American Boga-Grip, available in different sizes for various fishing situations. Virtually every fly-fishing person I work with anywhere carries one. But this is an expensive and relatively heavy bit of kit. The lightweight, gun-shaped Berkley Tec Trigger Grip is perfect for British bass fishing, and it sits conveniently in a holster around your waist, out of the way until the time you need it. Wrap the lanyard around your wrist, run down to the edge of the water and simply pull the trigger and safely grab the bass. Once you let go of the trigger, the clamp locks into place and can’t open up until you depress the trigger. The predator is now secure. 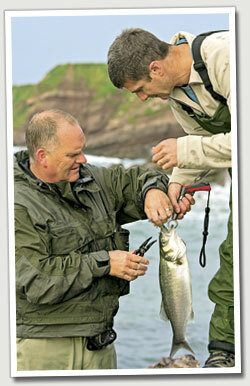 Don’t wave it around high up off the sand – it is far better for the fish if you keep it low to or on the ground. Move back from the water’s edge and use the fish-grip to secure the bass while you take the hooks out, or stand in the water while you unhook it and slip the fish back from where you are standing. When the bass is too big to lift, you literally have to think on your feet and work out how to get it in. Always put your safety first and do not put yourself in a dangerous position to land the fish. I know we all get very excited at catching a good fish, but is it really worth a life? Use the sea to help you land the bass. Sometimes you can steer it into a handy gully or rock pool, which is the preferred way. If you are wading, then you can steer the fish to hand. On your own everything becomes that much tougher, but thinking fast usually does the job. With a friend you can work as a team and time the landing to coincide with wave patterns. I can’t give you hard and fast rules about what to do, but experience and common sense works every time. Notice that all the photographs, which were taken on the south-east coast of Ireland, show the bass close to the water, and this is because the well-being of the fish is of the utmost importance to me. By all means capture memories of your catch in pictures, but keep the fish in the water, let it calm down and recover, and keep its time out of the sea to an absolute minimum. Release the fish only when you can feel it kicking hard either in your hands or on a fish-grip, which will mean that it has regained full strength. For me the biggest thrill of bass fishing is watching a fish that I have taken swim away...and to do that you need to know how to handle the fish properly. Landing bass on rocks is a different matter. I wish all my fish were big, but in all honesty a lot of the time the easiest way to land a bass is simply to lift it out using the rod. Make sure to keep the rod as low as possible when you do this, and never point it to the sky and swing the fish up and in. Modern rods are seriously strong, but any rod tip that is doubled over can snap. This is one time you wish you had your long-handled or telescopic landing net with you. Lay the fish down, use your fish-grip on the bottom lip and take the hook out. Hook barbs should be crushed so that hooks can be removed with speed. I don’t feel comfortable with the thought of having to struggle to get a set of three fully barbed trebles from a fish’s mouth, especially if I have got one eye on its spikes and sharp gill plate. There are no real landing or handling problems when you are bass fishing from a boat. You simply steer them in over the landing net and scoop up the fish. Easy, quick, efficient and good for the fish. The bass gets lifted out of the water and laid on the deck. A lot of people will wet a rag with seawater, lay it over the body of the fish, and then remove the hook. Many anglers don’t realise that just about the safest way to pick up a bass with bare hands is to simply grip the fish’s lower jaw. There are no real teeth to do any damage and your hand is well clear of the spines and gill plate. The great thing from the bass’s point of view is it can spike you, but this can cause you to drop the fish on the deck. That wouldn’t be a good day out for the fish. The bonefish that you find on tropical saltwater flats are livewires when you finally get them in, but a trick is to hold one upside down and take the fly out. It might work with bass, too, but watch out for those spikes. The first rule of shore fishing for bass is to carry a landing net. Why not travel with a collapsible one clipped to the back of your fishing waistcoat, like a trout angler? It is easy to say that you should be carrying a landing net, but the thought of walking miles over rocks with a long-handled net is a nightmare, which is why travelling the trout way could be an option. The key to bass fishing is mobility, and being able to fish close to the waterline, so you might want to dispense with a net.